Abrazi makes beautiful handmade jewelry for both the modern and the classical bride. Because of the choice of a wide range of pearls and crystals in different sizes and colors, each jewel can be equipped in a unique combination. In this way, the designs can be perfectly adapted to the specific wishes and tastes of the customer. Luminous in both style and class. Every jewel is unique. 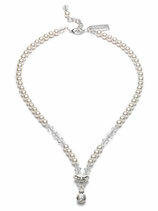 Because it has been handmade for you, as a bride or as a shining center of attention at a gala. It suits who you are and where you are. Your taste is reflected in a collection that sparkles and shines. 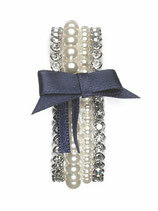 Pearls and crystals, large and obvious or small and subtle. Choose what makes your heart beat faster, because that is always the best choice. Bright Swarovski crystals, pure silver, to complete your jewelry. Everything is possible and within reach. As long as it excels in quality and sustainability, that’s our standard.